It's hard to believe that those Salemites have been loving, scheming, serial killing, celebrating, back from the dead rising, partying, laughing, gossiping, University Hospital working, super coupling, Hortoning, Bradying, Brady's pub dining, marrying, mall-walking, mysterious drug-trying, lake house visiting, Christmas-ball hanging and oh so much more since DAYS OF OUR LIVES #DAY50 began in black and white so long ago. 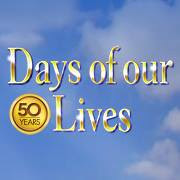 Fans of Days were told that they would have a lot to look forward to as their 50th anniversary approached, and Ken Corday and the clan have not disappointed. We've seen some people we enjoyed meet their demise with the necktie killer, but we've also seen so many of our favorites coming back to their hometown, and more are in transit. Bo may be in shackles now but he's on his way back. Patch is back and and still in black. Sean just arrived home. Doug and Julie are always around, The Dimera clan is growing and who knows if EJ will soon follow? And a storyline is growing for Abe. Finally. So it's back to usual in Salem, which is the usual we have all come to love for 5 decades. Tip: There will be a line which will be outside as the store is not as big as the fan base is! Also there is not a whole lot of parking in the mall lot, so be prepared to hunt for a space, possibly on another street. However, it's always orderly there, and once you get in, you will get a face to face with each person signing. beloved world of Salem to its loyal viewers.